Illus. in full color. “Don’t be fooled by the title of this seriocomic ode to success; it’s not ‘Climb Every Mountain, ‘ kid version. All journeys face perils, whether from indecision, from loneliness, or worst of all, from too much waiting. Seuss’ familiar pajama-clad hero is up to the challenge, and his odyssey is captured vividly in busy two-page spreads evoking both the good times (grinning purple elephants, floating golden castles) and the bad (deep blue wells of confusion). Seuss’ message is simple but never sappy: life may be a ‘Great Balancing Act, ‘ but through it all ‘There’s fun to be done. '”–(starred) “Booklist. Everyone loves Dr. Seuss! A true original, he wrote and illustrated over 50classic children’s books with total sales of more than 100 million copies. Forchildren of all ages. We purchased one copy for each of our kids. We have their coaches, teachers, etc. sign the book after each season with a little message. We plan to give them the books when they graduate from high school. What’s really neat is they are 6 and 11 and have no clue we have been doing this. Hopefully we can keep that up and it makes a nice surprise and keepsake for them. I gave this book to my stepchildren when they graduated from college. I read it myself in my 30s because I was a freelance writer, and this simple book helped me gather the courage to open myself to all the possibilities. I had a very successful career as a freelance writer of only non-fiction. In my retirement, I need to read this again as I’m now writing and indie publishing serious mid-grade/young adult fiction as Pleasant Oliver and once again, I need its boost of enthusiasm and courage for all the wonderful possibilities and opportunities that are going to come my way! In Spring 2018, I will give it my great nephew as he graduates from high school, and in later years, I will give it my other great nieces and nephews when they graduate from high school–maybe again when they graduate from college! 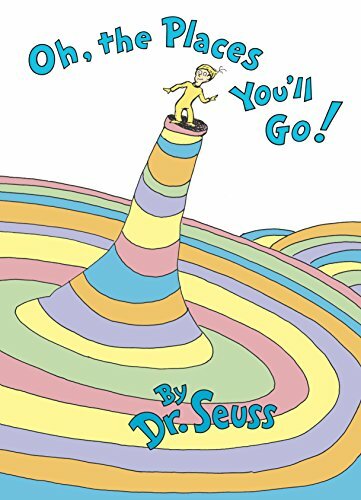 I read this book several times to my class of 5th graders every year- because I feel like it really speaks a lot about life. I work in a Title I school, where we are really focusing on getting all of our students to succeed- via whatever path they choose after high school. Many of our children had never been out of the county before this year, when we took them on a field trip across the state to a zoo. I feel like this book not only encourages them, but also kind of gives them a heads up of the reality of “later life”. Sometimes you aren’t on top of the world, and you do get lost, and you do have to keep going to try to get out of your rut. And you don’t want to be caught with the people who are just “waiting around”…we want them to be proactive and do something about it. I save up all year and purchase each of my students a copy and write a note to them individually, so that they know that they have someone who is in their corner, really pushing for them. That being said, I also read this to my own small children- because they just really enjoy the story, and all of the pictures.